In one of his first acts as commander in chief, President Obama in 2009 signed an executive order to close the U.S. detention camp at Guantanamo Bay, Cuba. It was part of a campaign promise the president made, to close the camp and "determine how to deal with those who have been held there." But four years on, the controversial prison remains open. The president and his administration believed Guantanamo was a symbol of the contentious counterterrorism policies of his predecessor, George W. Bush; ones that included harsh interrogation tactics, rendition and indefinite detention. John Bellinger, a senior legal official in the Bush administration, says the new administration miscalculated how difficult it would be to close Guantanamo. "I think part of it was that a number of officials in the administration had come to believe that a lot of innocent people were being held and that they could be released," Bellinger says, "[and those] remaining could be tried in federal court and that all this could be done easily in a year." But Bellinger says the Obama administration quickly learned that it wasn't so easy to transfer some of the roughly 240 prisoners still held at that time to their home countries — or even to third nations. A review by the Obama administration found that probably only two dozen of the detainees could be successfully prosecuted in a federal court, because of weak or little available evidence. They also found that about 50 prisoners were deemed too dangerous to ever release. At about the same time, says Benjamin Wittes, a senior fellow in governance studies at the Brookings Institution, Congress began pushing back on plans to move some of the detainees to prisons on the U.S. mainland. "When actually confronted with the question of 'do you want to close Guantanamo if that means bringing a lot of detainees to the United States?' the 'keep Guantanamo' constituency was actually much more politically powerful ... than the administration had anticipated," Wittes says. Six months into the new administration, a Democratically controlled Congress passed legislation that prevented the president from moving any Guantanamo detainee into the U.S. or to other countries, a policy that continues today. Wittes says with other competing priorities on the boil, such as a stimulus plan and health care, the president had to decide whether closing Guantanamo was a priority. So within a few months, the question became: "How much political energy and capital was the president willing to invest in getting it done?" he says. As it turned out, none, he says. 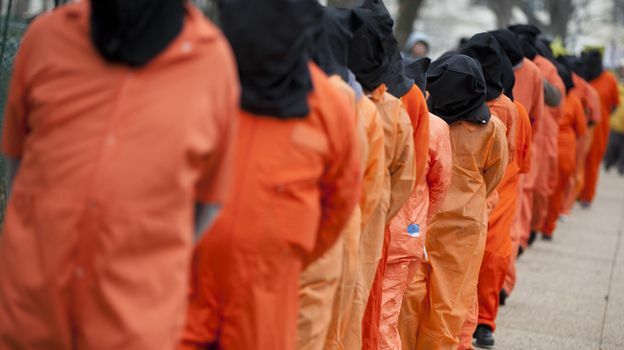 Andrea Prasow, a counterterrorism counsel at Human Rights Watch, says the president's unwillingness or inability to fight hard to close Guantanamo has been disappointing. "I — like many people in the human-rights community — took the president at his word when he said he would close Guantanamo," Prasow says. "But the fact that not only is it [still] open, but there's no pathway towards its closure and towards ending indefinite detention is one of the great tragedies of Obama's first term." Still, sentiment about closing the prison camp or bringing detainees to the U.S. is as strong now as it was then. A recent report by the Government Accountability Office said that the detainees could be transferred to U.S. prisons safely. Republican Sen. Lindsey Graham of South Carolina disagreed. "Simply stated, the American people don't want to close Guantanamo Bay, which is an isolated military-controlled facility, to bring these crazy bastards that want to kill us all to the United States," Graham said. Roughly 165 detainees still remain at Guantanamo, and military trials for five men accused of plotting the Sept. 11, 2001, attacks are due to resume early February.